Q: Could you please let me know what the Ph of water in a hair salon should be? A: pH (which stands for potential hydrogen and comes from the French term pouvoir hydrogene, meaning hydrogen power) levels are probably one of the least understood properties that are discussed in regard to salon products. The level of pH of a substance has to do with measuring the ions in that substance. An ion is an atom or molecule that carries an electrical charge. Ionization is the separating of that substance into ions. The ions created have opposite electrical charges. Negatively-charged ions are called anions (AN-eye-ons), and positively-charged ions are called cations (KAT-eye-uns). With pure water (distilled water), some of the water molecules naturally ionize into hydrogen ions and hydroxide ions. The pH scale measures those ions. Hydrogen ions contain only hydrogen and are acidic, while the hydroxide ions contain hydrogen and oxygen and are alkaline. Since pH is only possible because of the ionization of water, only water-based solutions have pH. The pH scale is numbered 0 to 14. Pure water is neutral because every molecule of water that ionizes produces one hydrogen, and one hydroxide ion. This means that pure water has a pH level of 7. The pH level of the skin and hair is 5. 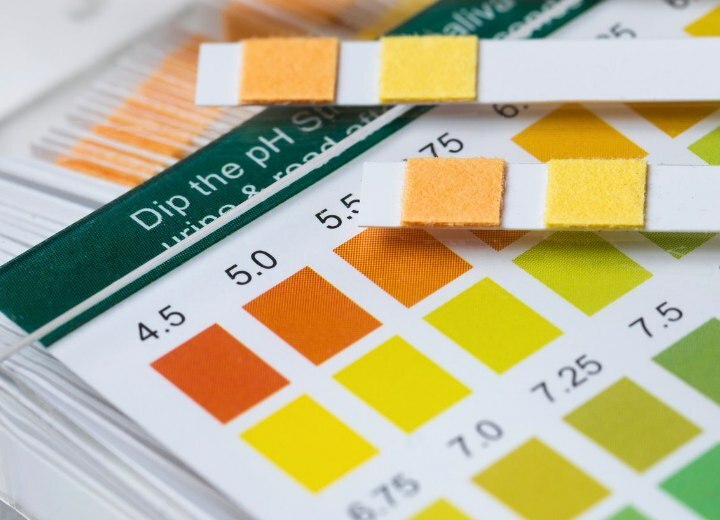 Every whole number step along the pH scale increases the comparative alkalinity or acidity of a substance compared to another by a factor of 10. This means that pure water is 100 times more alkaline than skin and hair (ten times ten) and skin and hair is 100 times more acidic than pure water. This comes into play in the hair salon since most of the salon chemical services are based on acidic and alkaline reactions. Acids harden and contract the hair, while alkalis swell and expand the hair these properties allow many manipulations to take place and to be countered in many chemical services. Most tap water used in the salon will be around 7.0 on the pH scale, ideally, and most manufacturer's products for the hair and skin take into account this factor when creating their products. (Equal parts of a pH 9 and a pH 5 solution will create a pH of 7 - or neutral pH.) You do want some alkalinity to ensure thorough cleansing, but will always want to balance the alkalinity and acidity in the hair to return it to its natural pH level. If you used a shampoo that was pH 5.0 - the same as hair and skin - it would be less effective than a shampoo with a pH between 7 and 8. There are some areas where the tap water is more alkaline and needs to be treated for some uses (such as in aquariums, etc). If your salon feels that the alkalinity of the water in the area is too high, they can look into acquiring and installing water treatment appliances that can condition the water and lower the alkalinity to neutral levels. What is pH balanced shampoo?